We are surrounded and embraced by stars peacefully circling around our world. Even to people of today, the night sky exerts a profound influence. We may even secretly believe in the music long said to emanate from this overwhelming silence. Those of us who have the fortune of knowing the stars can find answers to their innermost questions. 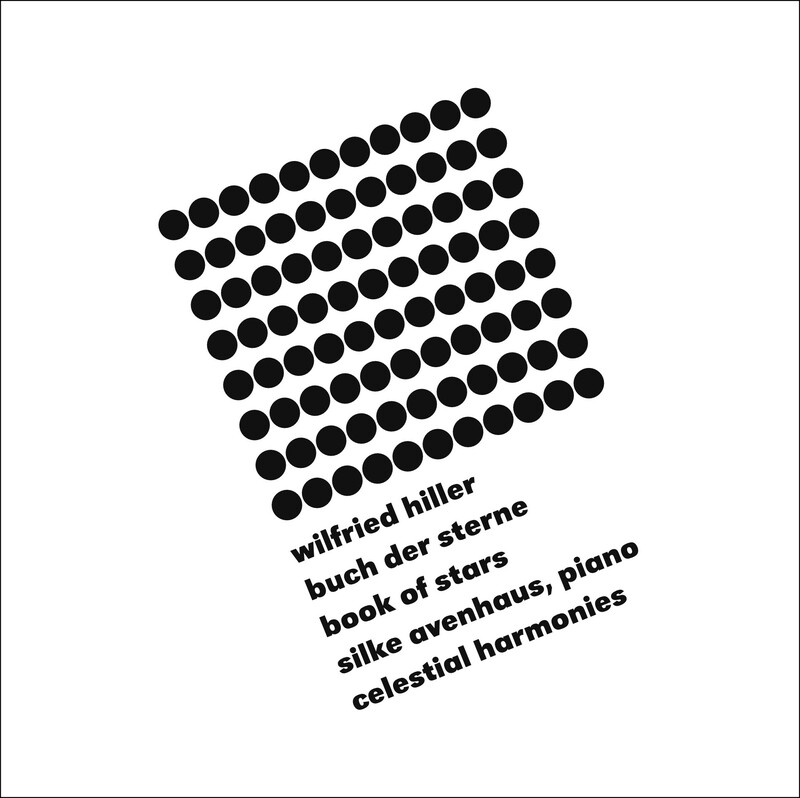 Wilfried Hiller's BUCH DER STERNE / BOOK OF STARS is a result of such a dialogue. Wilfried Hiller developed his own personal dialogue with the stars early in his childhood. He knew as a child how his parents had communicated over long distances by gazing at Alkor, the little rider of the second star in the handle of the Big Dipper. As a teenager he was fascinated by the world of Greek mythology, the stories of which are littered in the stars. As an adult he experienced the proximity of the stars from the coast of Turkey, later from his refuge on the Aegean island of Phournoi. Astronomical aspects are present, openly or hidden, in many of his works. BUCH DER STERNE / BOOK OF STARS is a documentation of his personal study of the constellations and of the efforts of humans of all times and places to make sense of what is written in this vast nocturnal mirror of anthropomorphic dreams. Fantasies become sound and the kaleidoscopic poetry of masked games. BUCH DER STERNE / BOOK OF STARS is founded on the principles of order and mass, acknowledging the power of numbers. Without sacrificing the individual characters of the sometimes quite stormy pieces, the 72 miniatures are arranged with great care. Each piece is associated with one particular musically gravitational note; fortuitously, Hiller could ascribe one of the 88 keys of the piano to each constellation of the northern and the southern hemisphere. Simultaneously, the traditional emphasis on the constellations of the Zodiac is reflected in an ascending cycle of fifths, beginning on D1. Wilfried Hiller's own personal impulse glows through everything, whether contemplative or speculative. In many of the pieces, particularly the more formally far reaching constellations, he describes scenes from real life. A wonderful example is the drama of Perseus and Andromeda. Initially, a curtain seems to rise, into which is delicately but threateningly woven the W motif of Cassiopeia. Andromeda must suffer a horrible punishment because of her mother's arrogant speeches. But then Perseus leaps into a fierce battle with the monster Cetus, while her father Cepheus watches silently and passively. Hiller's music is a gripping description of all this, focussing on the battle with Dionysian fervour. So rich in sonic ideas is BUCH DER STERNE / BOOK OF STARS, and rich in secrets. The latter must never be revealed, and the former cannot adequately be enumerated. It is safe to say, however, that even in the smallest Bagatelle Hiller was entirely concentrated on finding a truthful representation of the spirit of each constellation. The young, much-in-demand German pianist Silke Avenhaus appears as soloist and in chamber concerts. Her concerts have taken her throughout Germany as well as to the UK, France, Holland, Norway, Austria, Switzerland, Spain, Hungary and the USA. She has played in venues such as the Berliner Philharmonie, the Philharmonie and Herkulessaal in Munich, the Semperoper Dresden, St. Martin-in the-Fields and the Wigmore Hall in London, the Salle Gaveau in Paris, the Concertgebouw in Amsterdam and various festivals througout Europe. Silke Avenhaus was born in Karlsruhe, took her first recorder lessons in Vienna at the age of five and attended her first piano lessons at the age of six. Still young she won numerous competition and was awarded a scholarship by the Edwin Fischer Fund. Her teachers included Anna Stadler, Klaus Schilde and Bianca Bodalia. She also benefitted from studying with György Sebök at Indiana University in Bloomington, USA. 1 MENSA Lacaille auf dem Tafelberg / Lacaille on Table Mountain 4'46"
2 ERIDANUS Fluß der Tränen / River of Tears 4'11"
3 ORION Wilhelm Herschel beobachtet den Orion / Wilhelm Herschel observes Orion 5'33"
4 AQUILA Der Adler des Zeus / The Eagle of Zeus 1'52"
5 CRUX Das Kreus des Südens / The Southern Cross 2'05"
6 ARIES Das goldene Vlies/ The Golden Fleece 1'27"
7 CANIS MAIOR Der Höllenhund Zerberus / The Hellhound Cerberus 1'00"
8 CENTAURUS Der weisse Cheiron / The White Cheiron 1'39"
9 ARA Der Perle von Chrysomilea / The Pearl of Chrysomilea 3'52"
10 SAGITTA Der Pfeil des Herkules / The Arrow of Hercules 0'29"
11 PAVO Die hundert Augen des Argos / The One-Hundred Eyes of Argos 1'51"
12 DORADO Der Goldfisch / The Goldfish 0'49"
13 TAURUS Der verliebte Stier / The Amorous Bull 2'50"
14 BOOTES Ochsentanz / The Dance of the Ox 1'12"
15 TRIANGULUM Delta der Venus I / Delta of Venus I 1'04"
16 LEPUS ET CORVUS Der Hase und der Rabe / The Hare and the Raven 0'33"
The Sculptor Rudolf Wachter (after a poem by Ulla Muth) 1'49"
18 HOROLOGIUM Die Pendeluhr des Joseph Haydn / Joseph Haydn's Pendulum Clock 1'09"
19 DRACO Der gefrorene Drache / The Frozen Dragon 0'38"
20 GEMINI Wurrawarra, der tasmanische Tiger / Wurrawarra, the Tasmanian Tiger 1'53"
21 URSA MAIOR Alkor, Stern der Sehnsucht / Alkor, the Star of Desire 6'42"
22 TUCANA Der Volgel auf der Kleinen Magellanschen Wolke / The Bird on the Small Magellanic Cloud 1'30"
23 CRATER Trinklied nach Franz Schubert / Drinking Song after Franz Schubert 1'11"
24 AURIGA Tarot VII / Tarot VII 1'33"
25 APUS Der Paradies Alastair / Alastair, the Bird of Paradise 0'42"
26 ARGO Das Schiff der Argonauten / The Ship of the Argonauts 5'58"
27 CANCER Melodie im Spiegel / Melody in Mirrored Reflection 2'01"
28 VULPECULA Der kleine Fuchs und die Gans / The Little Fox and the Goose 0'18"
The Shattered Shield of Archilles (Fragment of Fragments) 1'16"
30 PEGASUS Das geflügelte Pferd / The Winged Horse 3'41"
1 PERSEUS ET ANDROMEDA Die Versteinerung / The Petrification 4'35"
2 LEO Der Schlaf des Herkules in der Höhle des Löwen / The Sleep of Hercules in the Lion's Den 2'29"
3 HYDRUS Die männliche Wasserschlange / The Male Watersnake 0'22"
4 GRUS Totenklage des Kranichs/ The Crane's Lament 2'13"
5 PISCIS VOLANS Der fliegende Fisch / The Flying Fish 1'22"
6 CANES VENATICI Die Jagdhunde des Bootes / Boote's Hunting Dogs 0'15"
7 a) Bei Windstille / During Calm 1'12"
8 b) Bei böigem Wind / In Gusty Wind 1'26"
9 PICTOR Der Mahler Adam Elsheimer (1578-1610) / The Painter Adam Elsheimer (1578-1610) 1'27"
10 VIRGO Persephones Klagegesang / Persephone's Lament 3'09"
11 HYDRA Die weibliche Wasserschlange / The Female Watersnake 0'25"
12 LUPUS Der Wolf und die Plejaden / The Wolf and the Peiades 1'53"
13 MONOCEROS Das Einhorn von Bomarzo / The Unicorn of Bomarzo 1'09"
14 OPHIUCHUS ET SERPENS Der Äskulap-Stab und die Schlange / The Staff of Aesculap and the Serpent 2'59"
15 SEXTANS Der Sextant / The Sextant 1'04"
16 LIBRA Die Waage (Tarot VIII) / The Balance (Tarot VIII) 1'58"
17 CORONA BOREALIS Die Krone der Ariadne (Tarot XVII) / The Crown of Ariadne (Tarot XVII) 1'55"
18 CORONA AUSTRALIS Die südliche Krone / The Southern Crown 1'13"
19 COMO BERENICES Das Haar der Berenike / The Hair of Berenice 1'29"
20 DELPHINUS Der Gesang des Arion / The Song of Orion 1'57"
21 CYGNUS Der verliebte Schwan / The Amorous Swan 1'39"
22 SCORPIUS Der Wächter des Unterwelttores I / The Sentinel of Hades I 1'50"
23 INDUS Melodie des Indianers / Melody of the Indian 2'14"
24 LEO MINOR Schlarflied für einen kleinen Löwen / Lullaby for a Baby Lion 1'38"
25 CAMELOPARDALIS Giraffengalopp / Galloping Giraffe 1'00"
26 PHOENIX Phönix / Phoenix 2'07"
27 SAGITTARIUS Der Wächter des Unterwelttores II / The Sentinel of Hades II 1'46"
28 EQUULEUS Die Pferdekopfbüste / The Bust of a Horse's Head 1'38"
29 LACERTA Die Eidechse von Chrysomilea / The Lizard of Chrysomilea 0'43"
30 TRIANGULUM AUSTRALE Delta der Venus II / Delta of Venus ?? 1'04"
31 LYNX Die Luchsaugen des Hevelius / The Lynx Eyes of Hevelius 1'32"
32 CAPRICORNUS Das Schofar von En Gedi / The Shofar of En Gedi 1'04"
33 CANIS MINOR Der kleine Hund / The Lesser Dog 0'40"
34 CHAMAELEON Das Chamäleon / The Chameleon 0'50"
35 PISCIS AUSTRINUS Der Einsame / The Solitary 1'18"
36 MUSCA Die Fliege oder der Bumerang / The Fly or the Boomerang 0'26"
37 AQUARIUS Die Steine des Deukalion/ The Stones of Deucalion 1'40"
38 URSA MINOR Schlarflied für einem kleinen Bären / Lullaby for a Little Bear 0'43"
39 PISCES Venus und Amor / Venus and Cupid 1'01"
40 LYRA a) Die Leier des Heinrich I. F. Biber / The Lyre of Heinrich I. F. Biber 1'23"
41 LYRA b) Skordatur im Wasser / Scordatura in the Water 1'57"
42 HERCULES Herkules / Hercules 2'06"